Countless times i had dreamt of the day, The day i would be given a pair of wings and be let to roam mid-air. 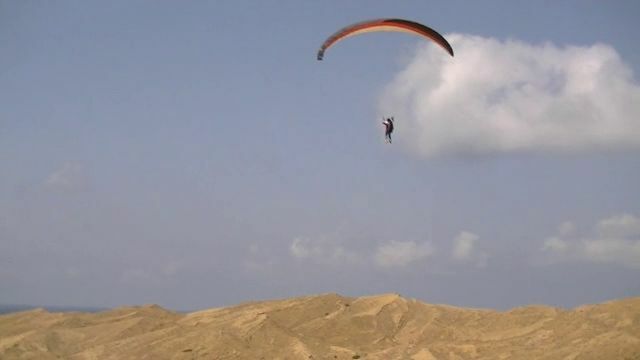 The dream was just a dream till I heard about paragliding experiences being offered in Pakistan. without much hesitation, i signed up for one. 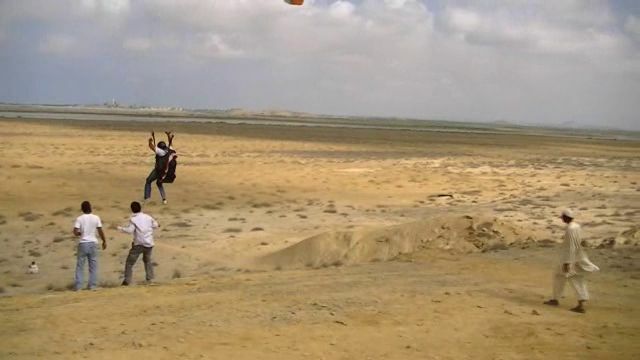 March, 2012 – My first attempt at paragliding was aborted due to fierce Karachi winds. Disappointed, I had to come back and wait till a new event date is announced. Alas! that day wouldn’t come until after 7 months. October, 2012 – Another ray of hope. Early morning sun was low above the horizon when me and my companions reported for the meeting point. Being fashionably late, we were hurriedly ushered to the instructions session which we had already experienced a few months back. soon afterwards, we were good to go for our ground training. Ground training involves you, clad in full gear and its about controlling your movements. The glider would remain afloat and you had to control your body to get accustomed to the surge and controlling equipment. Once our struggle with ground training was complete, it was time to move to the next level – The test flights. Test flights are done from a higher ground. preferably a rock or something similar. The objective is to get more accustomed to being airborne and test your controlling skills. Thus we were taken to a nearby elevated ridge and geared up. The glider was released and the wind was enough to carry one off into mid-air. Thus providing you the opportunity to experiment with your maneuvering skills. After dragging myself into the cliff the first time due to bad navigation, i somehow managed to complete my test flight successfully. phew! that was a relief and an extremely joyous moment to realize that your feet were above the ground and the glider is moving where you want it to move. Once we were through this stage, it was time for final show down – The solo flight. “oh crap!”, i thought. “Its like taking a blind leap of faith when you dont know how people have performed”. but the reassuring words of the instructors calmed me down and i geared up for the show down. While we waited for the wind to stablize, i looked around. THe view was stunning. A couple of miles down, we could see the blue sea of Mubarak Village and the majestic Churna Island further down the line. The sea always calms me down and it did the same that time. a few minutes later, i heard the words: “Ready?”, i nodded. The glider was let go and it fluttered in the breeze, my heavy bulk felt meaningless against the pressure exerted by the glider. The instructors stablized me and within moments, i was airborne. first floated above the ridge but then i was dragged farther away…. it was then when i noticed the abyss below me. The flight couldn’t last more than a minute, but that minute was more precious than a lifetime. the moment of bliss lasted till my feet touched the ground and i had to control my movements not to be dragged to the ground by the winds. The flight was over…. but the euphoria will last forever. It may just be a start of a series of wonderful experiences. ~ by burhanahmad on October 14, 2012.